PedalDancer.com is a bike blog for travelers and cyclists. Intended as a free educational source for the public, with stories from Colordo, California and France, with bike event calendar lists, bike race dates, bicycle and travel stories, cycling and bike race photography, bike routes, recommended bike climbs, cycling travel tips and maps. With France road sign and tollway travel tips. I try hard to stretch my world, to keep pushing those boundaries back, back. To stop those tendencies which threaten to make my world feel secure, yet small. The ones that let my opinions form too quickly based on my own experiences without seeing the bigger picture and considering the views of others and the world from the outside in. 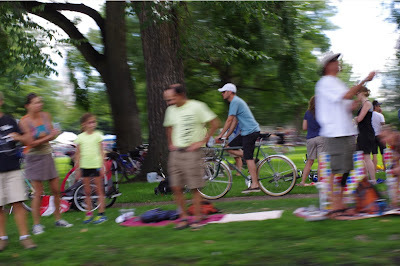 Studying the effort given on a bike during a stage race crossing a chunk of the state of Colorado, and witnessing those individuals who watch a bike race, is a perfect time to revisit this lesson. 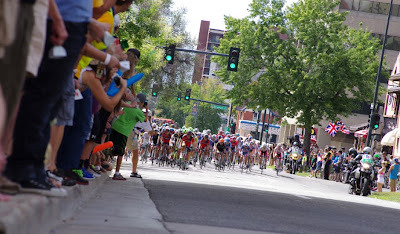 After thirteen years of chasing pro races in Europe and the Continent, last Sunday in Denver I got inside Media car #1 to experience the bigger picture of Stage 7 of the USA Pro Challenge. Let me tell you I learned. I learned that there may have been 12 people interacting with any given fan in one location during the race that day, and perhaps 50-100 on that fan's immediate block where they stood to watch the race, but block after block was filled with individual fans. Some areas so dense I felt immensely proud of the support given to this race by the citizens of my city. The collective whole was impressive. It was huge. 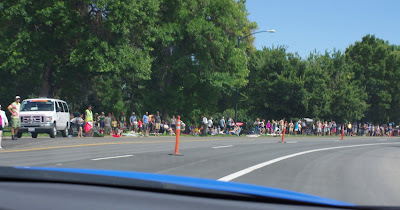 I wish every fan could have the opportunity to see the totality of this race from a car along the entire route or from a helicopter hovering overhead. 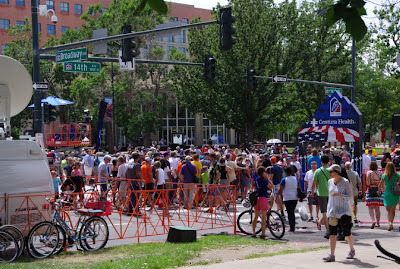 From block to block, from city to city along the route, thousands of individuals gave time to come out and watch the race. I hope every single one of them enjoyed themselves. Whether the race was more or less convenient to your hometown this year, you can rest assured it was indeed more convenient to someone else's hometown. Stage races are meant to change, and change it will again. 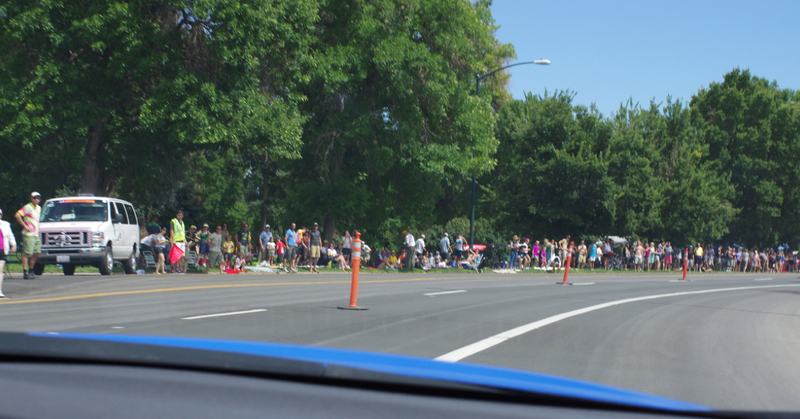 I also saw the race from the riders perspective. As much as we all comment on how fast the riders race by us, well, it feels equally as fast from the the rider's point of view. Keyed into the race around them and also to the riders next to them, a bike racer has little left to notice each fan lining the route. But that fan's impact is felt, the immensity of support and roar of cheers is certainly absorbed by the rider as part of the elements of racing. The riders are sincere in their appreciation of the fans coming out. A cheering crowd is the best tradition of competition. More than that - we the fans have a blast together on race day. 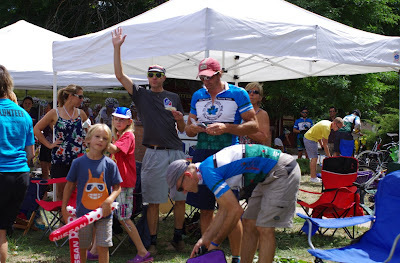 The highlight of this race for me was being out on course with new fan friends and old bike friends. 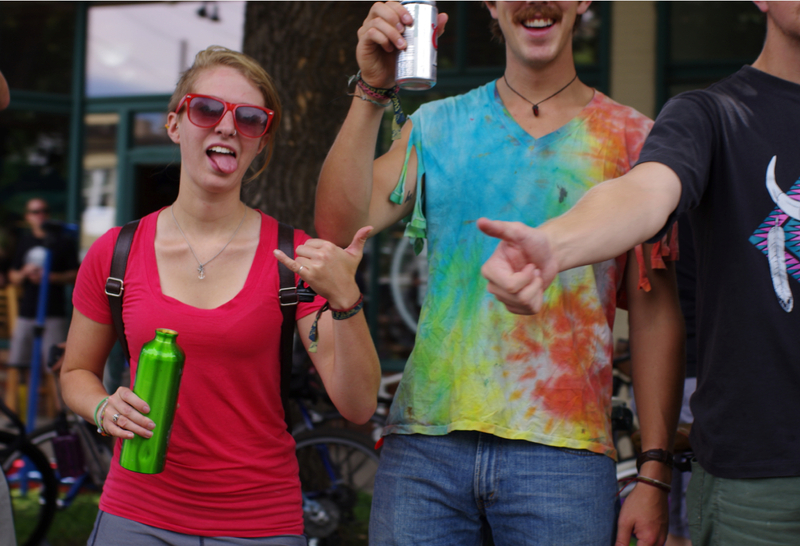 Riding our bikes, jumping around on the side of the road, meeting people visiting from out of town, generally having fun together outside on a beautiful day in Colorado. 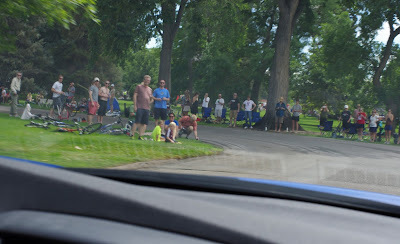 I imagine everyone along the miles of route was having fun equal to my own. Well worth a planned vacation day if possible (and I do wish it possible). Although I also saw how dirty the city was. Sorry, but it is true. Within 15-minutes after arriving at the race in Denver early Sunday morning, I looked down at my camera lens to see a layer of dust covering the glass. Yuck, I guess I'm not in mountain air any more. 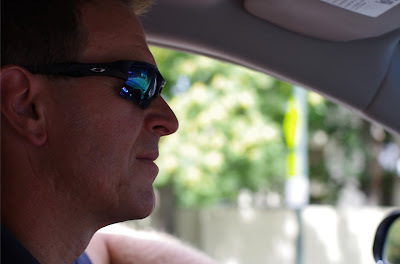 The first comment Steve (from Greenville, South Carolina), the driver of Media car #1, made to me as we hit the course on lap 1 was, "Man, the streets are dirty." Yes they were. Filthy. A layer of gravel and dirt lay over a good third of the road on each side. We were both quiet for a moment as we churned over the consequences of racing on those conditions as a rider. By the second lap we could see a rising cloud of dirt surrounding the peloton and every support vehicle. News hit the radio that Chris Froome had pulled out of the race at lap 2, claiming lung issues. A shame to have him not complete the race, although his presence here all week and effort given at our high altitude was honorable (whereas an elite level rider is not meant to stay in top form all season). Chris Froome had his reasons from his view of the race. The Rocky Mountains are tough riding and extremely tough racing. We have a State of hardy active people and cyclists. Last Tuesday, for the first time ever on a race day, I drove my car to the top of a mountain pass. I took in the smell of the pine trees and the cool mountain air with windows down. As I ascended Independence Pass on four wheels, I could hear the chatter of the cyclists climbing on two wheels. "Nice to meet you," or "Wow look at that," they would say to each other as they rode side by side. Cyclist after cyclist after cyclist. Did they have a sense of the hundreds preceding and following them as they climbed their current bend in the road on their way to the mountain peak? A massive amount of fun. For every time a rider signed an autograph for a fan or said hello, for every sign held high, bike ridden to the race, sandwich bought, free tshirt snatched up, screams shouted, or even beers handed up - there were thousands of other fans out there enjoying the race in a similar way. 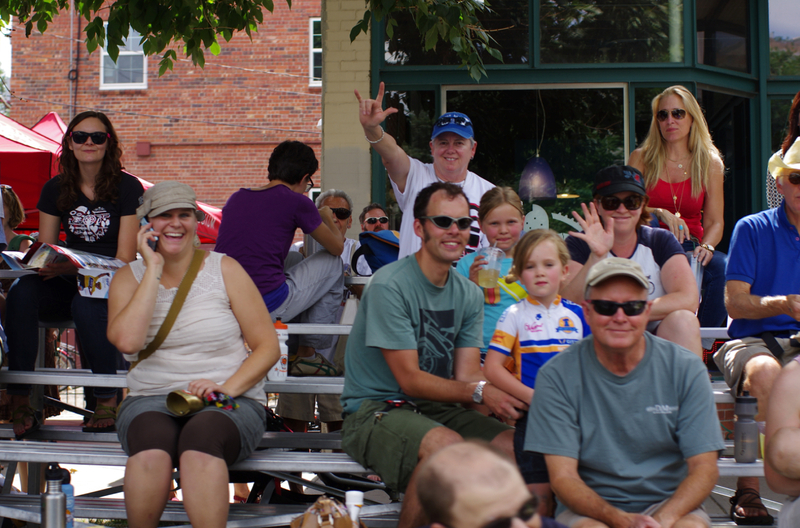 The peloton that stretched across 599 miles of what was the 2013 USA Pro Challenge, brought us all together as a community to create our own unique experiences and yet share in the one common joy of cycling. We are a growing sport with a growing race. 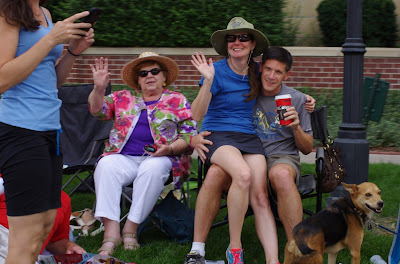 Not only did I feel a boost in readership during this race, I know of others who also had a significant boost in readership from last year to this year. 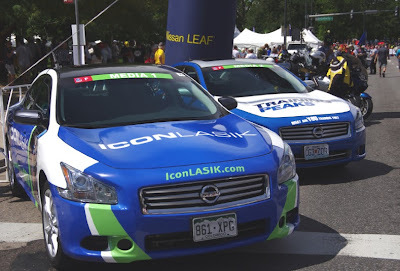 We deliver cycling information to national and international readers. Another reason to think broad in regards to the growth of this race. 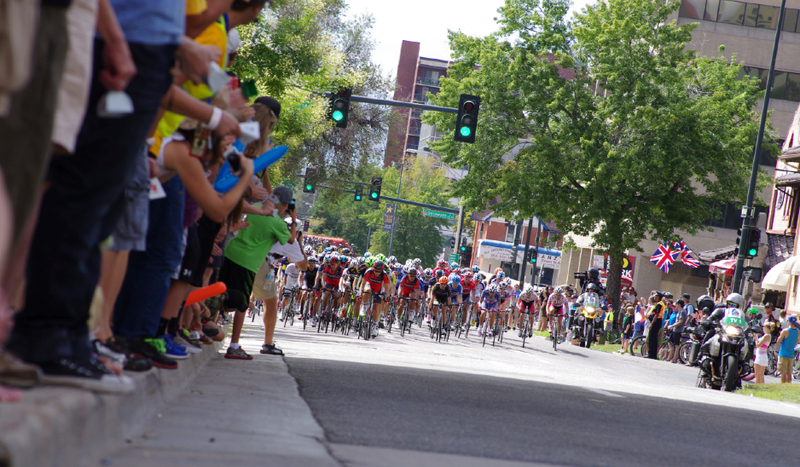 The USA Pro Challenge is a UCI 2.HC race, one of only two in our nation. 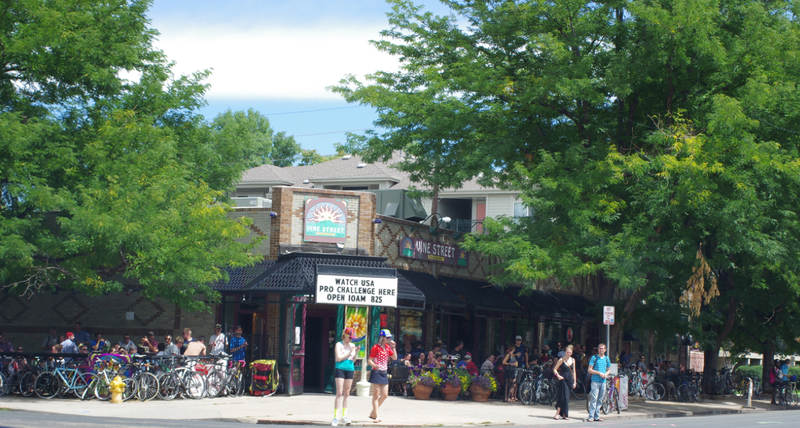 We have a gem here, right in our own backyard. Thanks to each and every one of you who made the time to come out and play together and support the race in Colorado. You not only experienced your own view of the race you added to that measurable concept of "economic impact" - you made it fun by contributing to making cycling in Colorado and the USA a big deal. 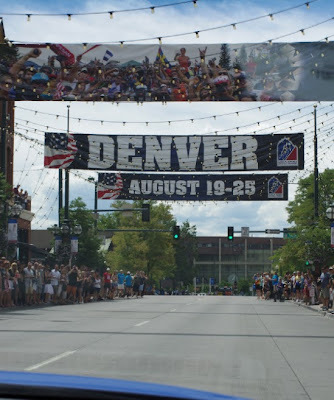 And for the 20% of spectators who traveled to Colorado to see the race - come back again next year and be sure to bring a local with you! Steve, from South Carolina, driving the Media vehicle that broadened my world (and a darn good driver). Seeing the race from a car, not a bike or from one spot on the side of the road, is a entirely different perspective. 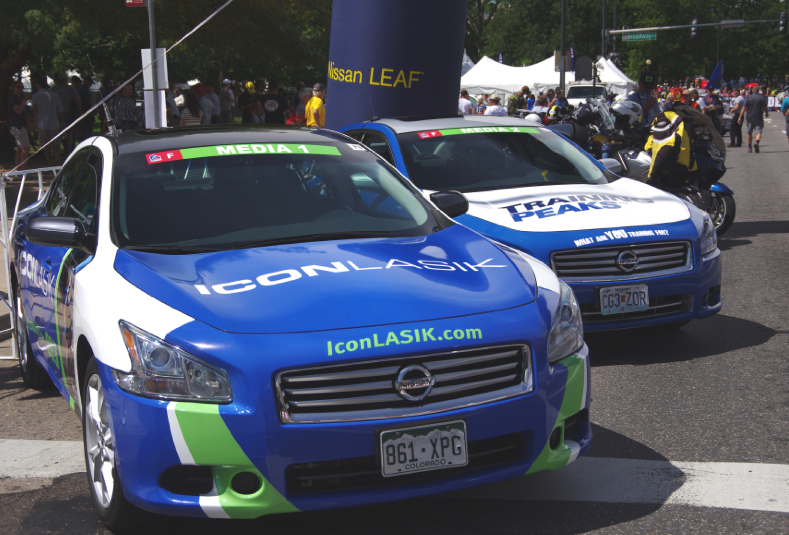 That was my ride - Media car #1 sponsored by IconLasik. Thank you. FANS!!! in Denver on race day (random photos taken of wonderful people along the road as we drove the route, block after block). 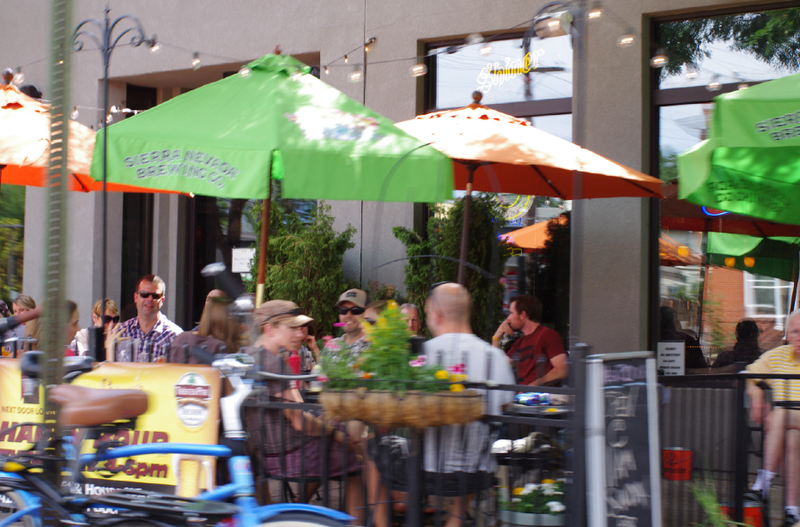 Neighbors and traveling visitors out enjoying the race in downtown Denver near our Library. 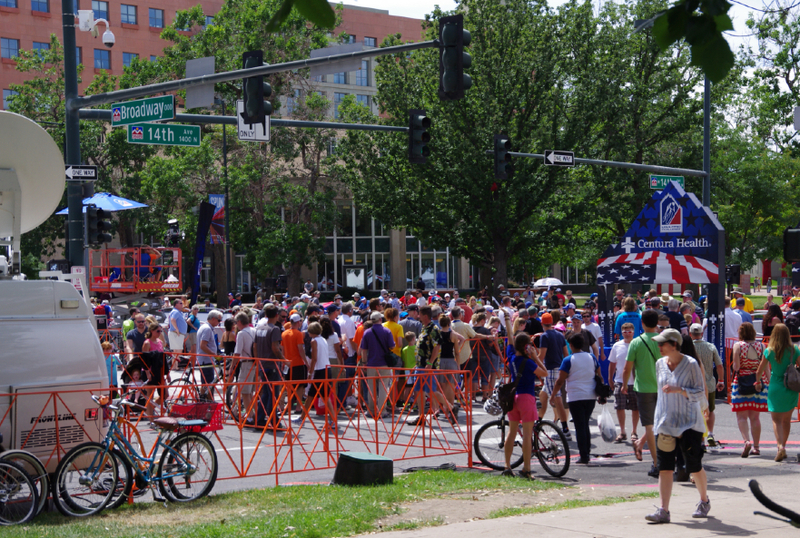 Fans lining the race route in Denver watched 8 laps covering 3 hours of racing. 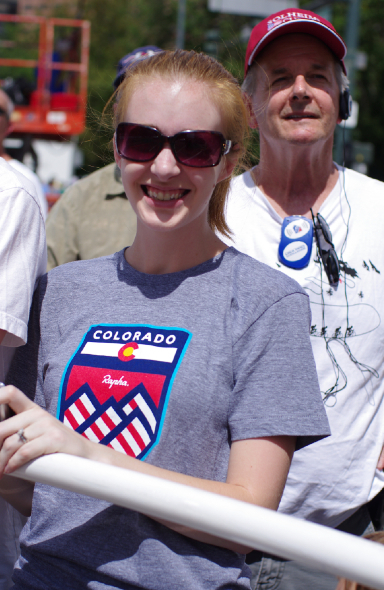 And finally these two fans wearing my vote for best fan tshirts from the Tour - the Rapha Colorado and the Nissan KOM shirts. Inspiring cyclists and travelers Pedal Dancer is a bike travel blog for travelers, cyclists and cycling fans. 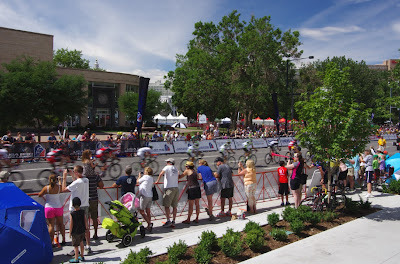 Covering Colorado, France, Tour de France, Spring Classics in Belgium, Cycling Events and more. 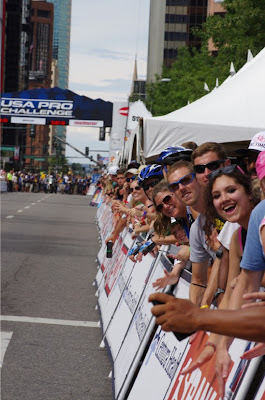 A resource light on opinion and heavy on information and joy of the sport. 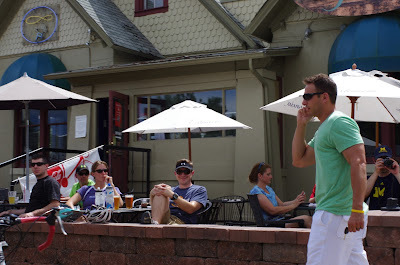 Topics include: bike routes and cycling climb descriptions, travel tips, race reports, spectator guides, cycling and travel photography. 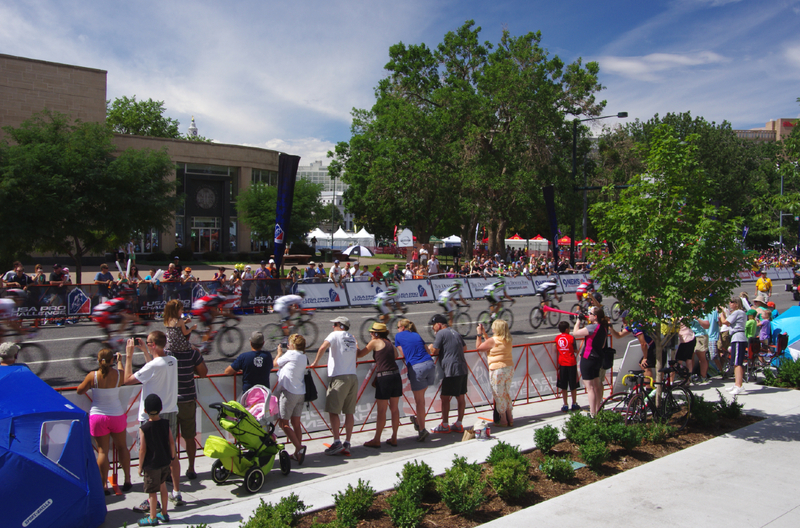 Chris Froome and Peter Sagan coming to Colorado! Visitors to PedalDancer.com from 25,000+ cities around the world! © All Content and © Photos by Pedal Dancer®. Awesome Inc. theme. Powered by Blogger.